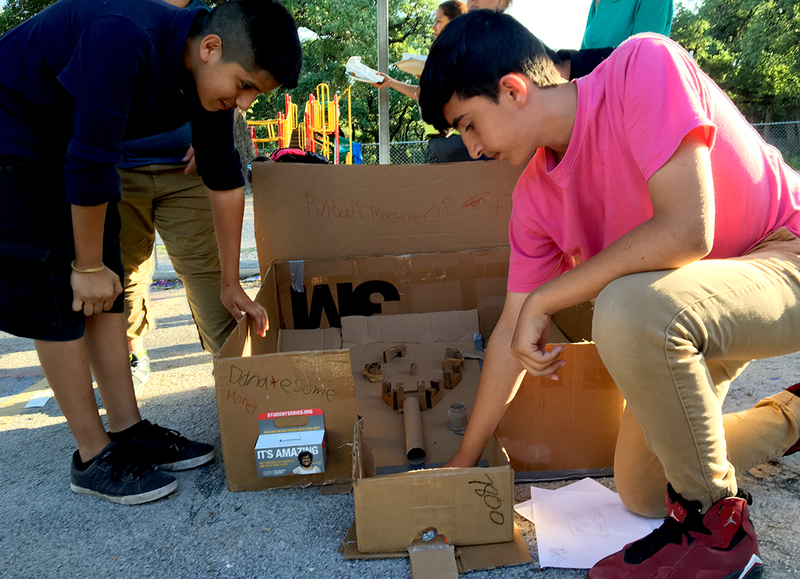 On the Wednesday before Earth Day 2016, LaTerika Wilson, coordinator of the Texas ACE after-school program at Cedars International Academy and longtime EcoRise partner, began counting down: “Three, two, one…GO!” The Cardboard Challenge had begun! With screams of exhilaration, Wilson’s students hurled themselves at the giant pile of donated cardboard in their school courtyard. Dragging pieces bigger than themselves off in all directions and armed with tape, glue guns, and colorful art supplies, the kids settled into five teams to bring their hand-drawn designs to life. A team of adult volunteers stood ready to assist and document the fun. The Cardboard Challenge is part of Time Warner Cable’s Connect A Million Minds and Go Green initiatives, sparking the spirit of invention, creativity and sustainability among a new generation of young people. Kids organize their own teams, design their own creations, and build them into reality using repurposed cardboard and other recyclables. 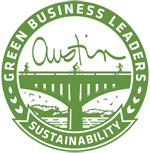 Many of the Cedars students learned big lessons from the Challenge, such as time management and teamwork, accurate planning and blueprinting, improvising, and the need for sustainable solutions to everyday problems. 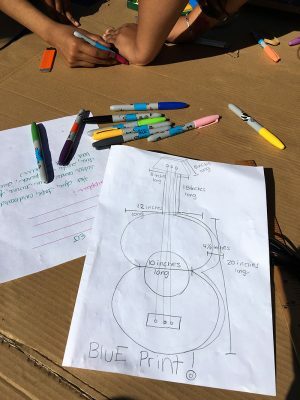 Made primarily out of cardboard, the day’s projects included a life-sized guitar with a scale model, a working pinball machine, a rocket with a pre-departure photo backdrop, a wearable robot suit, and a playhouse with solar-powered features. Families and teachers were invited to watch the Cedars students at work, and a panel of judges representing EcoRise, Time Warner Cable, Cedars International, and Huston-Tillotson University’s Green Is The New Black group listened to students’ final presentations, taking notes on scorecards. Time Warner Cable presented awards and fun prizes at the celebration dinner afterwards. Special thanks to Time Warner Cable for their partnership with the innovators at Cedars International Academy!